Carbon Forks on certain 2017 Model year MERIDA Scultura bikes sold nation-wide between July 2016 and July 2017. In some circumstances, the fork steerer tube of the full carbon fork has insufficient strength & the fork steerer tube might develop cracks below the stem or spacers. If the defect occurs whilst the bicycle is in use, this could result in losing complete control of the bike, resulting serious injury or death. 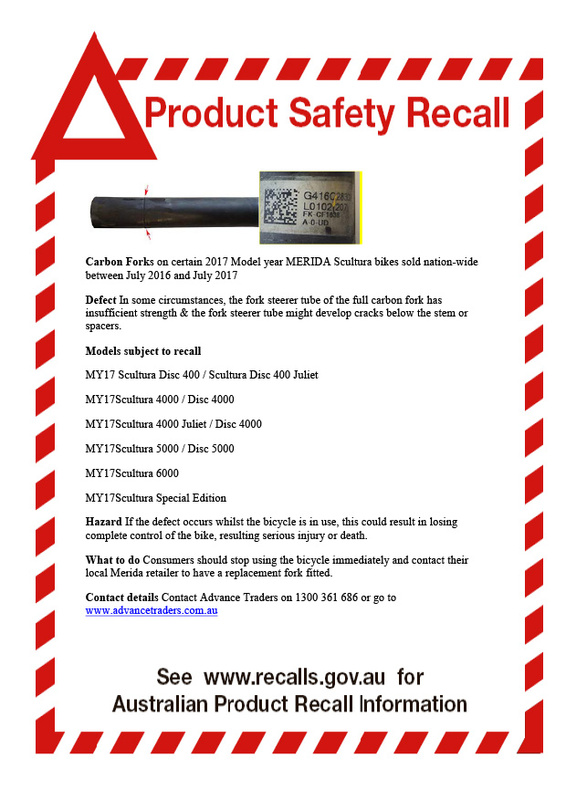 Consumers should stop using the bicycle immediately and contact their local MERIDA retailer to have a replacement fork fitted.